Cr2O3 is a magnetoelectric antiferromagnet, and its antiferromagnetic domain state is controllable by the simultaneous application of magnetic and electric fields. In the 2000s, that is, more than 50 years since the discovery of the magnetoelectirc effect in Cr2O3, efforts were initiated apply this effect to engineering applications. In this article, we review the recent progress of the magnetoelectric control of the antiferromagnetic domain state and the related phenomena of Cr2O3, in particular, in an all-thin film system, an essential step to the application. The review covers the research and development of perpendicular media nanostructure focusing on the recording layer. The recording layer material includes the Co-alloys with hcp structure, the magnetic multilayers, and the alloys with ordered structures that have high magneto-crystalline anisotropies (Ku). The technologies of underlayer or interlayer for aligning the easy magnetization axis of magnetic crystal grain perpendicular to the film plane are briefly reviewed including the high Ku magnetic materials for future recording media. Observations of compositional and magnetization structures in sub-μm scale have played important roles in improving the recording layer. Typical data on these characteristics are explained in relation to the media structure improvements. Considering that high Ku magnetic materials will be employed in future recording media, basic experimental results related in controlling the easy magnetization axis and in keeping the surface flatness of L10-ordered magnetic materials are explained. Future possibilities for increasing the areal density beyond 1 Tb/in2 by improving the magnetic material and the nanostructure of recording layer are also discussed. Various transition-metal magnetic materials have been investigated from basic and practical viewpoints. The concentration dependence of the Néel temperature TN of Cr-based alloys is complicated. Cr-Si and Cr-Fe antiferromagnetic alloys show Invar characteristics in the ternary alloys. Fe-based amorphous alloys exhibit weak ferromagnetic properties, resulting in remarkable magnetovolume effects. The icosahedral quasicrystals containing Mn show a spin-glass behavior, in a similar manner as those of amorphous counterparts. Itinerant-electron metamagnetic transition occurs in La(FexSi1-x)13, accompanied by many drastic change in magnetic and elastic properties. These drastic changes are practically useful in the field magnetic refrigeration and linear magnetostriction. The magnitude of TN of Mn-based γ-phase is increased by addition of Ir, Ru, Rh and the spin structures change, depending on temperature and composition. Several kinds of L10-type Mn alloys have a high value of TN with a large magnetocrystalline anisotropy. The shift of the exchange-bias field for the collinear spin structure in L10-type phase is induced by spin frustration. L21- and B2-type Co2CrGa metallurgical stable alloys exhibit a high spin polarization. Several kinds of L21-type and B2-type alloys show a large ferromagnetic shape memory effect associated with twin-boundary motions. L10-type alloys and L21-type Heusler alloys are key materials for future spintronic and magnetic storage devices. L10-FePt with high uniaxial magnetic anisotropy is a promising material for ultrahigh density recording because of its high thermal stability of magnetization at a nanometer scale. Co-based Heusler alloys showing high spin polarization of conduction electrons enable us to enhance the magnetoresistance effect. In addition, utilizing the magnetization dynamics in these ordered alloys provides us with new paths in the development of spintronic and magnetic storage devices. In this review, we introduce the control of magnetization switching field for L10-FePt exchange-coupled with Ni81Fe19 by utilizing the spin waves in the bilayers, which will be useful for information writing. A nanometer-scaled rf oscillator is also introduced, in which the magnetization dynamics is excited by spin angular momentum transfer. We can improve both the rf output power and the oscillation quality simultaneously by using Co2(Fe0.4Mn0.6)Si Heusler alloy. The current status of R&D activities and major results are briefly reviewed, mainly focusing on work reported since about 2010. 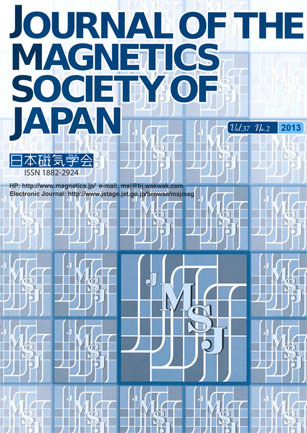 Developments in and perspectives on less-Dy and Dy-free Nd-(Dy)-Fe-B-type permanent magnets, search and discovery of new hard magnetic materials, progress in the basic understandings of coercivity in hard magnets, and perspectives on anisotropic nanocomposite permanent magnets are overviewed.